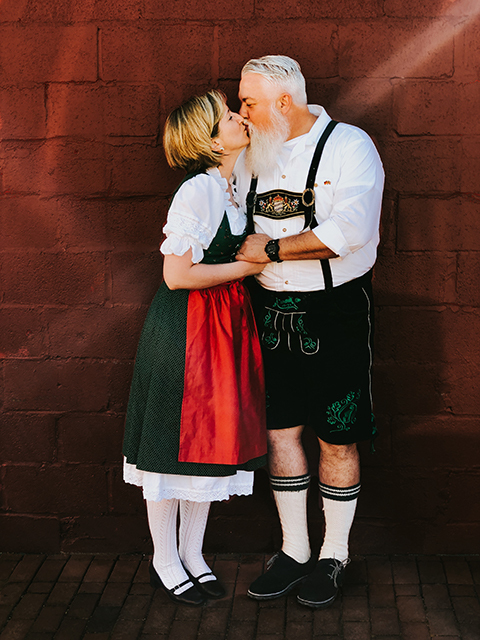 It all started many years ago when Bill Haase was still in the United States Marine Corps, and Nikki was a recent college grad with a degree in German and Business Administration. While attending a German beerfest together in Cape Coral, Florida, Bill had his first traditional German Hefeweizen. A brewing foundation was formed, and they were married soon after. Bill left the Marine Corps and earned a degree in Environmental Engineering at North Carolina State University. He got a job at an engineering firm, and a colleague introduced him to brewing his own beer. Since that day, Bill’s passion for homebrewing has grown exponentially. In 2006, Bill & Nikki moved to Leesburg in Loudoun County, Virginia. Bill invested in his own brewing equipment and continued his self-study of brewing science. As part of his necessary beer education, he & Nikki made a pilgrimage to Germany. They toured microbreweries in Bavaria, Franconia, Cologne, and Düsseldorf, and they were inspired to open a brewery of their own. They attended American Homebrewers Association conferences and, encouraged by their friends, Bill submitted beers for his first official contest, the National Homebrew Competition in 2014. Sanctioned by the American Homebrewers Association, it is the world’s largest international beer competition. In the first round regional contest in Philadelphia, Bill earned a first place medal in the light lager category and a third place medal in the European amber lager category. His beers advanced to nationals, where, in the final round, his Märzen style took the bronze. Armed with validation, brewing science, and an upgraded brew system, Bill was ready to go pro. Bill & Nikki have dedicated much preparation, planning and hard work together to realize this dream, and all of the pieces are finally coming together.